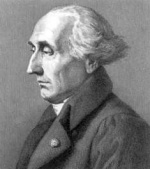 Lagrangian mechanics is a reformulation of classical mechanics, introduced by the Italian-French mathematician and astronomer Joseph-Louis Lagrange in 1788. In Lagrangian mechanics, the trajectory of a system of particles is derived by solving the Lagrange equations in one of two forms, either the Lagrange equations of the first kind, which treat constraints explicitly as extra equations, often using Lagrange multipliers; or the Lagrange equations of the second kind, which incorporate the constraints directly by judicious choice of generalized coordinates. In each case, a mathematical function called the Lagrangian is a function of the generalized coordinates, their time derivatives, and time, and contains the information about the dynamics of the system. No new physics is introduced in Lagrangian mechanics compared to Newtonian mechanics. Newton's laws can include non-conservative forces like friction; however, they must include constraint forces explicitly and are best suited to Cartesian coordinates. Lagrangian mechanics is ideal for systems with conservative forces and for bypassing constraint forces in any coordinate system. Dissipative and driven forces can be accounted for by splitting the external forces into a sum of potential and non-potential forces, leading to a set of modified Euler-Lagrange (EL) equations. Generalized coordinates can be chosen by convenience, to exploit symmetries in the system or the geometry of the constraints, which may simplify solving for the motion of the system. Lagrangian mechanics also reveals conserved quantities and their symmetries in a direct way, as a special case of Noether's theorem.